Information about the 16th ACG conference can be found here: ACG 16. Information about the Computer Olympiad will be added here: Computer Olympiad. During the ICGA’s triennial meeting in Stockholm this past July, I announced that the term of office commencing this year would definitely be my final period as President. I have held the position from 1986-1992 and from 1999 to the present day, and it is high time for someone younger to take on the Presidency. In fact I had already tried but failed to find a replacement President to take over as from July, but none of the three people I asked, any of whom would be an outstanding President in my opinion, were available. In each case they responded that they had too many commitments to be able to devote themselves sufficiently to the demands of the ICGA. Since then, however, things have changed. I am delighted to report that Professor Jonathan Schaeffer is now available. I shall therefore be calling a special meeting of members, when I shall propose that Jonathan take over the presidency. That meeting will take place during the period August 10th-16th 2019, in Macao, where the ICGA will be holding its annual events – the World Computer Chess Championships, the Computer Olympiad, and the Conference on Computer Games. These will take place alongside the 2019 IJCAI Conference, and the ICGA is proud to be associated with IJCAI in this way for the second successive year. Jonathan needs no introduction to ICGA members and the computer games community at large. His achievements in our field are legendary. He led the Chinook program team, the first program to win a human world championship in any game (he later solved the game of Checkers, proving that the result with best play is a draw). He also led a team that developed a world champion level Hold ‘Em poker program, and in his youth he was the author of the Phoenix program which tied for 1st place in the 1986 World Computer Chess Championship. I have unbounded confidence that Jonathan will be an extremely popular and successful ICGA President, and will take the ICGA to a new level within the world of AI. The International Computer Games Association (ICGA) is very pleased to announce that our 2019 events will be held in Macao, alongside the annual conference of the International Joint Conference for Artificial Intelligence (IJCAI). The dates are August 10th-16th. Full details will appear in due course. 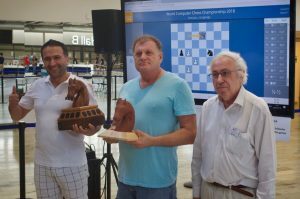 The World Computer Chess Championships will be sponsored with a 5,000 Euro prize fund, and travel subsidies for chess programs rated 2500 or more.